The term ‘Mahjong(g)’ denotes a Western variant (introduced to the West circa 1920, (see Stanwick 2004a)) of the Chinese game known by the double sinogram 麻雀 ma que, in modern pinyin1, literally ‘hemp bird’, but in the bonded form meaning ‘sparrow’. Further, the Chinese make no distinction between the thicknesses of their cards – cards of all thicknesses are called pai – and since ma que is first and foremost a card game played, more commonly, with very thick cards (that is, tiles), it is also denoted by the term 麻雀牌 ma que pai 2. 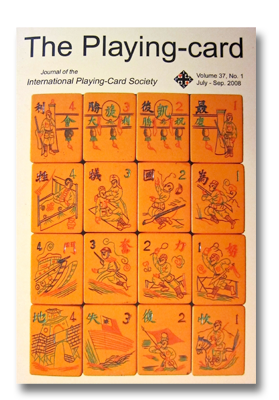 Since this article will be referencing descriptions of this Chinese game – specifically, of the tile set and, in part, the game-play – both terms are used in this article. Pinyin romanisation of Chinese is used throughout. Where other romanisations are used the pinyin form is in parentheses. Chinese characters of new, and some older, terms that appear in this article are referenced by roman numerals in square parentheses. For Chinese characters of other Chinese terms in this article, please refer to the previous Playing-card articles; Stanwick 2004 a, b and 2006 a, b. The authors’ comments are also in square parentheses. See Stanwick, 2004a. However aside from the name ma que, it was also known in the Late Qing period as peng hu (encountering harmony) (Lo, 2004). The ma que pai sets with which we are interested are those of Carl Himly and George Glover, collected sometime during the periods 1868 – 1876, 1872 – 1873 and 1875, respectively, (Stanwick, 2004a, 2006a). We are also interested in the set collected by Sheng Xuanhuai sometime between 1884 and 1892 (Lo, 2004 and Stanwick, 2006b). Finally, our interest also lies in a ma que set (Figure 1) pictured in a photograph in a ma que manual titled Kai han: Mâ jan kyô gihô by the Japanese Journalist Tokusaburo Nakamura and published in 1924 at Dalian (Manchuria, North China) (see Stanwick, 2004a, footnote 24; Ebashi, 2005; Depaulis, 2007)3. Figure 1. 1924 Nakamura tile set. From the documentary evidence it appears the three suits of the Himly, Glover and Nakamura sets represent denominations of money4; ‘Cash’ 同 [tong]5, ‘Strings’ (of Cash) 索 [suo] and ‘Myriads’ (of Cash) 万 [wan]. The Sheng Xuanhuai set also sported the first two suits, but had a ‘Ranks’ 品 [pin] suit6 instead of the ‘myriads’ [wan] suit (Stanwick, 2006a). Aside from the three suits, these sets also consist of extra groups of tiles. The first of these extra groups – the group known either as the four ‘Directions’ or four ‘Winds’, with the four tiles quadrupled and bearing the symbols for East 東 [dong], South 南 [nan], West 西 [xi] and North 北 [bei] – is found in the Himly, Glover and Nakamura7 sets and is also found in most known ma que pai sets after the 1870’s. However, there are exceptions. In the Sheng Xuanhuai set for example, the sixteen-tile group remains but the sinograms for ‘Four Directions’ are replaced by the alternative symbols for Benevolence 仁 [ren], Righteousness 义 [yi], Knowledge 道 [dao] and Virtuousness or Propriety 德 [de]8. But our particular interest lies in the remaining extra groups and relates either to the meaning and function of each of the tiles in each group or, where appropriate, to the group as a whole. It is to these extra groups we now turn. The Glover sets have a group of four ‘Center’ 中 [zhong] tiles. On the other hand, both the Himly and Nakamura sets have a group of four tiles of which the first three are a ‘Flower’ 化 [hua] tile9 of each respective suit – thus, from top to bottom, Myriads’ Flower 万化 [wan hua], Cash Flower 同化 [tong hua] and Strings’ Flower 索化 [suo hua]. The fourth tile in this group, as noted by Himly (1889), is a “King of All” (or ‘General King’) 摠王 [zong wang]. Other names for ‘zong wang’ can be ‘Almighty King’ and ‘Chief King’. A similar group of tiles is found in the description of the Sheng Xuanhuai set. However, in place of the 化 ‘hua’ sinogram, the description states that three of the tiles have the sinogram for 王 ‘wang’, thus 万王 [wan wang]10, 索王 [suo wang] and ‘King of Cakes’ 餅王 [bing wang]11. Further, there is a tile that is also found in the Himly set – a ‘King of All’ 摠王 [zong wang]. 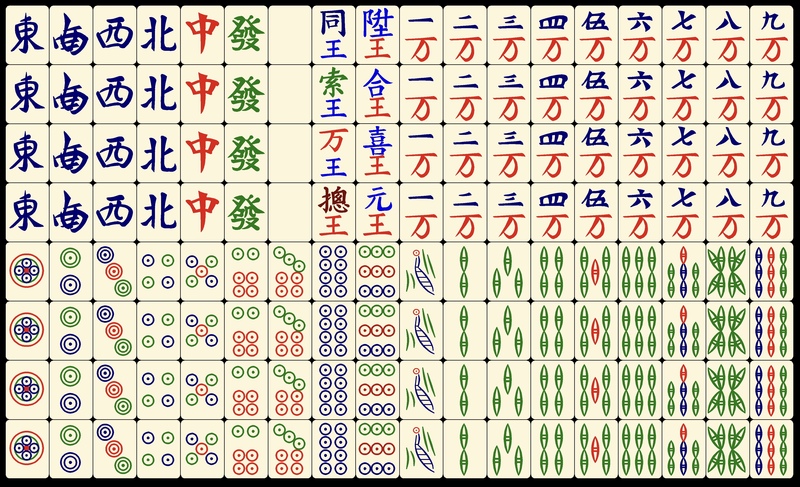 Of the remaining extra groups – and common to the Himly, Glover and Nakamura sets – are the four ‘King’ [wang] tiles of the ‘Four Directions’ – East King 東王 [dong wang], South King 南王 [nan wang], West King 西王 [xi wang] and North King 北王 [bei wang]; the four ‘King’, ‘wang’ tiles of Heaven King 天王 [tian wang], Earth King 地王 [di wang], Man King 人王 [ren wang] and Harmony King 和王 [he wang] and the four ‘Seasons’ tiles of Spring 春 [chun], Summer 春 [xia], Autumn 秋 [qiu] and Winter 冬 [dong];(see Stanwick, 2004a, 2006a). The Nakamura set also has four other groups of extra tiles sporting symbols for Flowers, Ranks, ‘Weathers’ and Blessings (see also Depaulis 2007). This tile set was introduced in Ebashi, 2005. These Chinese names were selected for the suits, here and in Table 1, since they are the earliest to appear, so far, in the documented ma que record. They appear to be Southern terms. Terms favoured by Northern Chinese are 餅 [bing] ‘Cakes’; 条 [tiao], ‘Strings’ (this appears later in the record) and 万 [wan] ‘Myriads’. This character appeared on a tile in a set described by Himly (1901) (see also Stanwick 2006a). In footnote 640, he observed “同 [tong] “with”, obviously an abbreviation of 銅 [tong] “copper”, what would, in that respect, mean ‘tong qian’ “copper piece”” [See also Vissering (1877, 1968) for mention of this money term]. In his description of a card game called 十胡牌 shi hu pai, Himly (1901) noted that one of the ten, three-card combinations or 胡 ‘hu’ was called “文錢 [wen qian] ‘copper piece’ = 1, 2, and 3 餅 bing [‘cake(s)’]”. [Note; ‘wen qian’, was also the name for a standard unit of money – ‘a cash-coin’ (Peng, 1994), and appears in Lo (2002), as the name of one of the suits – ‘Cash’, in a Late Ming four-suited money deck.]. In footnote 580, Himly (1901) also noted that according to the 1716 ‘K’ang-hi Tze-tien’ Dictionary; … “up to today in Ou in Min ( = Fu-Kien) and Hu-Nan, one casts silver into cakes [餅 [bing], (with the radical 食 ‘shi’, food’)] which is a vestige of the 鉼 ‘bing’” [with 金 ‘jin’, ‘metal’, hence ‘metal-cake’ – as in silver ‘cake’ (a silver coin)]. Note; 餅 [bing] can also mean ‘shaped like a cake’. Another term for the ma que ‘Cash’ suit, 筒 ‘tong’, ‘bamboo tube’, was later recorded by Han Bangqing (1892). According to Mayers (1874) there were Nine Degrees of Official Rank, where 品 ‘pin’ stands for a Degree of Rank. Note; the Nakamura set does not have any tiles with frames. The use of the alternative character, pin, for wan, and the four ‘Virtues’ for the four ‘Directions’, may be a reflection of Sheng’s Confucian ideology. Other alternative symbols were used, for example the ‘Four Ranks of Nobility’ – Duke, Marquis, General and Minister – in place of the four Directions (see Stanwick, 2006b). Himly (1889) states on page 461; “hua…here without the “sign” [radical 140] for plants which gives the meaning ‘flower’, thus = “change”.” However, Himly (1901), footnote 641, notes that “One does not think of 化 ‘hua’ “to change”, but of an abbreviation of 花 ‘hua’ “flower” (compare the zhi hua).” zhi hua from the money suited cards is also known as bai hua, “white flower”. However, according to Peng Xinwei (1994) 化 hua, to ‘change or transform’, was also an abbreviation for 貨 huo, ‘money’. As noted in Stanwick 2006b, this name may be a reflection that this suit was regarded as a ‘Myriads’ [wan] suit, even though it uses the alternative symbol 品 ‘pin’. 餅 [Bing]. Another term used for the ‘Cash’ suit. See footnotes 4 & 5. 2. An Explanation (Hypothesis) of the 'Flowers' and 'Kings Tiles'. “Here North China refers to (Bei) Ping [Beijing] and (Tian) Jin [Tianjin]. For “hua ma que” there are what is called Outer Flowers 外花 [wai hua] and Inner Flowers 裏花 [li hua]. Heaven King [tian wang], Earth King [di wang], Man King [ren wang], Harmony King [he wang]; East King [dong wang], South King [nan wang], West King [xi wang], North King [bei wang]; Spring [chun], Summer [xia], Autumn [qiu], Winter [dong]; Rain 雨 [yu], Sun 日 [ri], Wind 風 [feng], Snow 雪 [xue]; Orchid 蘭 [lan], Lotus 荷 [he], Chrysanthemum 菊 [ju], Plum 梅 [Mei]. [See Figure 2c for this tile set reconstruction]. However, in the latter-day hua ma que, people often add more sets of flowers such as Lute 琴 [qin], Chess 棋 [qi], Calligraphy 書 [shu], Painting 畫 [hua], Duke 公 [gong], Marquis 侯 [hou], General 將 [jiang], Premier 相 [xiang], etc. Even “Final Victory” [against Japan] 最後勝利 [zui hou sheng li] [see Figure 2b below] and “Will Win War of Resistence” [against Japan] 抗戰必勝 [kangzhan bi sheng] are sometimes added15. In a word, in principle (the Outer Flowers) should be five sets, but can be added to, [to make] nine sets, or even eleven sets according to the players. Most ma que players in North China custom-tailor the flower sets. [See Figure 2d for the tile set reconstruction with these additional Flowers]. Inner Flowers [li hua] are four pieces. Cash King 筒王 [tong wang], Strings’ King [suo wang], Myriads’ King [wan wang], General King [zong wang]. The Cash King [tong wang] can act as any of the ‘Cash’. [See Figures 2c and 2d for tile set reconstructions including these four tiles]. The functions of the Strings’ King and the Myriads’ King can be inferred accordingly. The General King [zong wang] can act as any of the Cash, Strings, Myriads, or East, South, West, North. “Multipurpose” tile 聽用 [ting yong], engraving two characters “ting yong” on a blank tile, means this tile can act as any of the ‘Cash’, ‘Strings’, ‘Myriads’, ‘Directions’ or ‘Center’, ‘Fortune’, ‘Blank’. [See Figure 2d for this tile]. The second ma que game is called Changsha’s 王麻雀 “wang ma que” [Kings Sparrow]. According to Liu: There are both resemblances and differences between ‘wang maque’ and ‘hua maque’. ‘Wang maque’ prevails in Changsha, Hunan [Central China]. The game-play is based on thirteen tiles [‘hua maque’ has sixteen]. A notable feature is that there are eight Inner Flowers [li hua] [‘hua maque’ has four]. The eight Inner Flowers are: Cash King [tong wang], Strings’ King [suo wang], Myriads’ King [wan wang], King of All or General King [zong wang], Cardinals’ King17 元王 [yuan wang], Combination King18 合王 [he wang], Happiness King 喜王 [xi wang], Promotion King 陞王 [sheng wang]. As they are called “wang”, so the game is called “wang ma que”. [See Figure 2e for this tile set reconstruction]. The usage of the Cash King [tong wang] Strings’ King [suo wang] Myriads’ King [wan wang] is the same as in hua maque. King of All [zong wang] has a different function than in hua ma que. It can act as any of the ‘Cash’, ‘Strings’, ‘Myriads’, or ‘Center’, ‘Fortune’, ‘Blank’, or ‘East, ‘South’, ‘West’, ‘North’. Cardinals’ King [yuan wang] can act as any of the ‘Center’, ‘Fortune’, ‘Blank’. Combination King [he wang] can act as any of the Cash, Strings, Myriads. The difference with the General King [zong wang] is that it [that is, he wang] cannot act as any of the East, South, West, North, or Center, Fortune, Blank. Happiness King [xi wang] can act as any of the East, South, West, North. Promotion King [sheng wang] has the same use as the King of All [zong wang], so it can act as any one of the whole set… The points and other rules are all the same (as common ma que) …”. Figure 2a. A bakelite tile set consisting of 16 ‘Flowers’. Produced in China. Figure 2b. 16 ‘Flowers’ depicting scenes of war. The top row says “Final Victory” [against Japan] 最後勝利 [zui hou sheng li]. Table 119 provides a list of all the types of tiles described, and implied, for Beijing/Tianjin hua ma que and Changsha wang ma que. Also listed are all the types of tiles found in the Himly, Glover, Sheng and Nakamura tile sets. 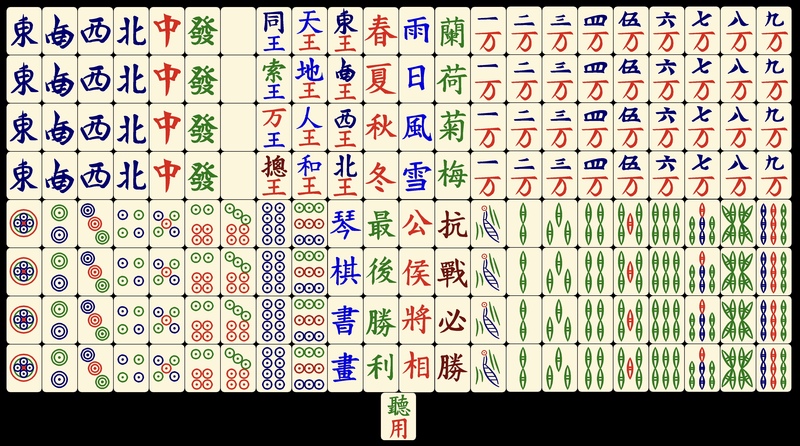 From Liu’s description and Table 1, we know that three of the Inner Flowers – tong hua, suo hua and wan hua – in both hua ma que and wang ma que, “can act as any” particular number of tiles within their respective suits, and that the identity of the target suit, is denoted by the upper sinogram on each tile. Table 1. Inner Flowers and Outer Flowers(These are the conventional number). * ‘Bing’, another term for ‘Cash’ [tong]. See Footnotes 4 & 5. Both games have a zong wang Inner Flower tile, thus completing a quartet, but with an upper sinogram referring to different target groups – that is, it denotes generalised usage. [Note; In the figures below, where the suits’ iconography is not known, the iconography from the (1924) Nakamura set (see Figure 1 above) was used since it contains many similarities with both the hua and wang ma que groups of Flowers]. Figure 2c. This North China Hua Ma Que tile set reconstruction depicts the one group of Inner Flowers and the five groups of Outer Flowers. (See table 1). Figure 2d. North China Hua Ma Que tile set reconstruction depicting the additional four groups of Outer Flowers that are sometimes added plus the ting yong tile. Figure 2e. Changsha’s Wang Ma Que tile set reconstruction depicting the eight Inner Flowers. From Liu’s observation above – that common ma que (Shanghai ma que /Classical Mahjong(g)) and hua ma que have the same game-play, except for some differences in scoring patterns, we may argue that similar tiles in both games have similar functions with respect to the formation of melds. This also applies to wang ma que, although in that game the wang tiles can be used to claim additional melds not available in hua ma que. 2.1 Inner ‘Flowers’ and Outer ‘Flowers’. In common ma que it is the three Suits, Directions/’Winds’, and the ‘Dragons’ from which melds are formed in the player’s hand and it is precisely these groups that are the target groups for the Inner Flowers in hua and wang ma que. Since the Inner Flowers function as substitutes, or ‘Jokers’ 20, for target tiles in these particular groups in order to form melds, we can therefore infer that Inner Flowers’ tiles are also used in the player’s hand – they are concealed. But what is the function of the Outer Flowers? Both common ma que and hua ma que use the four ‘Seasons’ tiles. In common ma que they are exposed, that is, they are used out of the player’s hand. 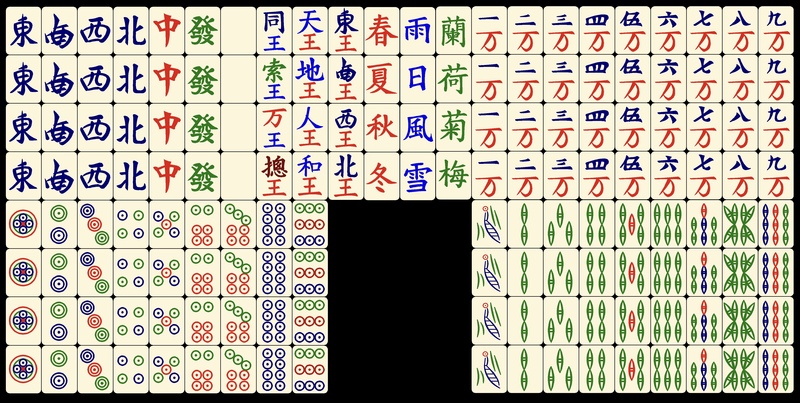 Given the inference that similar tiles in both common ma que (Shanghai ma que/Classical Mahjong(g)) and hua ma que have similar functions with respect to the formation of melds, the same function may be inferred for the use of the four ‘Seasons’ tiles in the hua ma que game. Further, since Liu states that in hua ma que the four ‘Seasons’ tiles Outer Flowers, we may therefore also infer that hua ma que Outer Flowers are used out of the player’s hand – they are exposed. In summary, Inner Flowers are ‘Jokers’ that function as substitution tiles for the formation of melds that are concealed. Outer Flowers, on the other hand, act as ‘Flowers’ as in common ma que /Classical Mahjong(g). Hence they are Flowers that, when acquired, must be exposed immediately. With reference to Table 1 and Liu’s statement that “… in principle (the Outer Flowers) [in hua ma que] should be five sets, but can be added to, [to make] nine sets, or even eleven sets …”, it is clear the 1924 Nakamura tile set (Figure 1) has identical tiles to the entire hua ma que tile set and also falls within the criteria for the number of Flower groups in hua ma que . Together with their relatively close proximity in time (~ 17 years) and their probable North China connection, we have good analogical grounds to argue that the Nakamura set is therefore an expanded example of that species of ma que game as exemplified by Liu’s North China hua ma que description. If this is the case, then taken together, both the 1941 description and the 1924 tile set give a more accurate view of the hua ma que game than does either one separately. 2.2 The ‘Flowers’ of the Himly, Glover, Sheng and Nakamura Tile Sets. Turning to the Himly set, and Table 1, it has identical Inner Flower tiles to those in hua ma que, and both it and the Glover sets have three groups that are identical to three of the five groups of Outer Flowers required for hua ma que. Taking their early appearance in the documented ma que record as an explanation for this difference in Outer Flowers group numbers (including the absence of Inner Flowers in the Glover sets as well as absence of the so-called ‘Dragons’)21, it is argued that both the Himly and Glover sets contain very early examples of the Inner Flowers (Himly set) and Outer Flowers (Himly and Glover sets) found in hua ma que 22. From this analogical approach, it is inferred that their uses and functions are therefore identical to those in hua ma que 23. We also argue that if the Himly, Glover and Nakamura sets are variations of a hua ma que tile set, and reflect actual hua ma que tile symbols, then they may provide a more accurate view of a hua ma que set’s tile symbols composition, than does Liu’s description. Now, in Liu’s and Dai’s written descriptions (for Dai’s description of the Sheng Xuanhuai set, see Stanwick 2006b Mahjong(g) before and After Mahjong(g) Part 2)), we have the presence of the three suit’s Flower tiles, described as tong wang (Cash King), suo wang (Strings’ King) and wan wang (Myriads’ King). However, in the Himly and Nakamura sets we have the corresponding three suit’s Flower tiles that actually have the sinogram for ‘hua’ – tong hua, suo hua and wan hua. Therefore, we may infer or suppose that Liu’s and Dai’s term ‘wang’, for the three Suit’s Flower tiles, may actually be their written description of the vocal expression for the three suit’s Flower tiles, which actually have the engraved sinogram for 花 ‘hua’. Thierry Depaulis24 also observed that the composition of the Changsha wang ma que variant corresponded (with the exception of one tile) with a variant game of Vietnamese ma que as described by Nguyen Xuan Mai (1950). According to Nguyen, the variant game uses either four or eight extra ‘King’ ‘wang’ tiles, each denoted by one, framed, sinogram – that is, without the ‘wang’ sinogram. Thus, for the ‘Four ‘Kings’’ game; 花 hua, 元 yuan, 喜 xi, 合 he are used. For the ‘Eight ‘Kings’’ game; hua, yuan, xi, he and also tong, suo, wan and zong are used. Comparison with the sinograms and functions of the eight Inner Flowers from wang ma que shows that, with the exception of the ‘hua’ tile25, the rest of the Vietnamese ‘King’ tiles sinograms and functions are comparable with those in wang ma que. These observations provide grounds for considering Changsha wang ma que a Southern China variant. Thanks to Thierry Depaulis, of the International Playing Card Society, for his helpful comments on this article. This was discovered by Hongbing Xu, who also provided the translation of the text. The names of some of the individual tiles were also translated by Michael Stanwick. Here the character for 花 ‘hua’ is with the radical 140 for plants and has the meaning of ‘Flower’. The theme of war is often found in polymer tile sets of the late 1930’s and early 1940’s. See Figure 2a and 2b. The dark blue characters in the top row in Figure 2a say “Final Victory [against Japan]”. …except for a scoring pattern called “No Honours No Flowers”. ‘Cardinals’ have the meaning of ‘fundamentals’, ‘basics’ or ‘elementals’. “He” has the meaning of ‘to join’, ‘combine’ and ‘be equal to’ or ‘equivalent’. The latter was chosen to represent ‘he’ at this point. The four ‘Directions’ tiles plus the three ‘Honours’ or ‘Dragons’ tiles are included for reference purposes. See also footnote 12. These four ‘substitution’ tiles share analogous functions with the three ‘zong’ cards mentioned by Lo (2004). That is, two are each tied to a particular suit of a Domino card game reported by Lo, while the third substitutes for both. Wilkinson (1895) and in both Culin (1895 in 1958) and O’Donoghue (1901) also mentions, for various card games, the use of blank cards or tiles as ‘Jokers’, that can take the place of any one card require. Liu noted that “in the latter-day [circa 1940] hua ma que, people often added more sets of flowers…” This suggests an increase in flower tiles with time. Conversely, then, it may have been that much earlier in time there were fewer ‘flower’ tiles. See Takashi Ebashi (2005) for a similar observation, in his discussion of the Nakamura tile set. However, it is important to note that in the ma que game described by Dai and played with the Sheng Xuanhuai tile set, the three suit ‘hua’ tiles as well as the ‘zong wang’ tile, are actually played as Outer Flowers, contrary to their counterparts in ‘hua ma que’ which are played as Inner Flowers. The ‘hua’ tile is called the “Queen of Flowers”. Once a player acquires it, it is immediately exposed and the player draws another card (tile) from the wall. In this way, it is used like an ‘Outer Flower’ in ‘hua ma que’. If this analysis and explanation is valid, then it is clear that the game of ma que has had a more rich and varied developmental history than was previously known. From evidence from the earliest ma que game (as evidenced by the earliest tile sets and descriptions) and from descriptions of ma que in Mid and Late Qing novels (see Lo, 2004 and Xu, 2007) including ma que game descriptions from manuals in the early 20th century up until Liu’s 1941 description, the ‘body’ of the game of ma que as expressed by its variant forms (see Stanwick 2004a) appears to have developed (and is developing) by a process of ‘mosaic evolution’, with various forms perhaps appearing and developing, and then either disappearing or co-existing, at different rates and periods, respectively, over time. Special thanks to Thierry Depaulis for his kind assistance with the text. Thanks to Julian Bradfield, for his translation of Himly (1901 Pages 7-11). Thanks also to Tony Watson for the illustrations of the reconstructed tile sets. Ebashi, Takashi, ‘Proto Mahjong. Mahjong Tiles in the 19th Century’. In: Mahjong Museum Report, Vol. 5, No.2, Issue 9, April, 2005, pp. 14 – 17 (in Japanese). Han, Bangqing, “Haishang hua liezhuan” (Lives of the Flowers of Shanghai). 1st standard Chinese translation by Eileen Chang (Zhang Ailing). Taipei. 1983. Standard Chinese version translated into English as ‘The Sing-Song Girls of Shanghai’ by Eileen Chang; Revised and edited by Eva Hung. New York. Columbia University Press. 2005. Liu, Yishu, “Maque de jingyan yu jiqiao” (Maque’s Experiences and Skills). Shanghai? “Jia ting tu shu guan” (Home Library). 3rd Edition. 1941. [The 1st Edition was published January 15th, 1941, by Xincun Book Concern, under the title “Maque yan jiu” (The Study of Maque) by the pen name Youxi Renjian Ke (A Guest Playing in the World). Lo, Andrew, ‘China’s Passion for Pai: Playing Cards, Dominoes, and Mahjong’. In: Asian Games: The Art of Contest, Colin Mackenzie and Irving Finkel, eds. Asia Society. 2004. pp. 217-231. Mayers, William Frederick, The Chinese Reader’s Manual. Ch’eng Wen Publishing Company, Taipei, 1978. (Facsimile reprint). (Originally published by the American Presbyterian Mission Press, Shanghai, China, 1874). Nguyen, Xuan Mai, Le mah-jong: guide complet. Jeu avec les 8 rois supplementaires. [Haiphong]: the Author, 1950. -68 ff. – 2006a. ‘Mahjong(g), Before and After Mahjong(g): Part 1’. In: The Playing-card, Vol. 34, No. 4, 2006, pp. 259-268. – 2006b. ‘Mahjong(g), Before and After Mahjong(g): Part 2’. In: The Playing-card, Vol. 35, No. 1, 2006, pp. 27-39. Vissering, Willem, On Chinese Currency; coin and paper money. Ch’eng-Wen Publishing Company. Taipei. 1968. (Facsimile reprint). (Originally Published by Leiden, E. J. Brill. Leiden. 1877.). – (1890): Published in 1901 in O’Donoghue F. M. Catalogue of the Collection of Playing Cards Bequeathed to the Trustees of the British Museum. – (1893): Published in 1895 in Culin S., Korean Games with Notes on the Corresponding Games of China and Japan, University of Pennsylvania. Facsimile reprint, Games of the Orient, Tuttle, 1958. – 1895. ‘Chinese Origin of Playing Cards‘. In The American Anthropologist, vol. VIII, p. 61-78. Xu, Hongbing, (2007). http://groups.google.com/group/rec.games.mahjong/ In; A Dated Summary of Chinese Literary Sources. Also in; Excerpts of Ancient Chinese Novels Mentioning Maque(long/Chinese).